Neousys reveals one of the industry’s most compact in-vehicle computer with PGA type Intel® 3rd-Gen Core™ i7/i5. Neousys is proud to announce the most compact size fanless embedded in-vehicle computer power by Intel Ivy-Bridge platform. 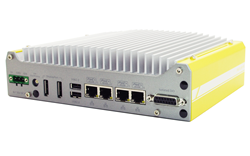 Nuvo-3100VTC is a fanless controller with E-Mark and EN 50155/EN 50121-3-2 certificate for in-vehicle usage. It supports 3rd-Gen i7 quad-core CPU to provide extraordinary performance for emerging high-end requirements. It also integrates four IEEE 802.3at PoE+ ports to facilitate Ethernet connectivity and power IP cameras for surveillance applications. Nuvo-3100VTC takes into account all demands of in-vehicle applications. It offer very compact footprint to fit into restricted space. Its 8~35V wide-range DC input and enhanced surge protection make Nuvo-3100VTC highly robust when car power applied. Nuvo-3100VTC further incorporates built-in RAID supporting data striping (RAID 0) and data mirroring (RAID 1) for two 2.5” HDDs. You can also take advantage of the hot-swappable HDD tray for easy HDD replacement. For in-vehicle installation, our patent-pending mounting brackets can absorb shock/vibration and extend overall system reliability. Combining superior performance, PoE+ and comprehensive design, Nuvo-3100VTC presents more possibilities for innovative in-vehicle applications! Nuvo-3100 supports PGA-type CPU to offer greater flexibility of CPU selection. PGA-type processors are with higher CPU power, and therefore introduce higher performance and more heat. To adapt Nuvo-3100 to various environments, we develop a unique function, configurable CPU power mode, to alter CPU power per user’s preference. Power Over Ethernet, or PoE, is a technology that passes electrical power along with data on a single CAT5/6 cable. Compliant with IEEE 802.3at PoE+ standard, Nuvo-3100VTC can supply 25.5W to each of its four ports. For in-vehicle surveillance applications, PoE+ significantly reduces the complexity of camera installation, as only one CAT5/6 cable is needed to connect and power the camera. Nuvo-3100VTC has built-in hardware RAID to enhance reliability and efficiency of disk access. It maintains two 2.5” SATA drives and supports RAID 0 (higher throughput) and RAID 1 (data redundancy). In addition, Nuvo-3100VTC hosts a hot-swappable HDD tray to accommodate one of SATA drives for storing portable information. Aiming at in-vehicle usage, Nuvo-3100VTC has comprehensive power circuitry design. It accepts 8~35VDC input range with enhanced surge protection to work reliably with battery power on the car (12V) or bus/truck (24V). Ignition power control is implemented to respond ACC signal according to configurable power on/off delay. Neousys Technology, established in 2010, designs and manufactures rugged embedded platforms and modules. With the core expertise ranging from embedded computing to data acquisition and processing, the goal is to innovate and integrate feature sets into products for various vertical markets and with simple intelligent architecture. For more information about Neousys Technology and the Nuvo-3100VTC, please visit: http://www.neousys-tech.com.